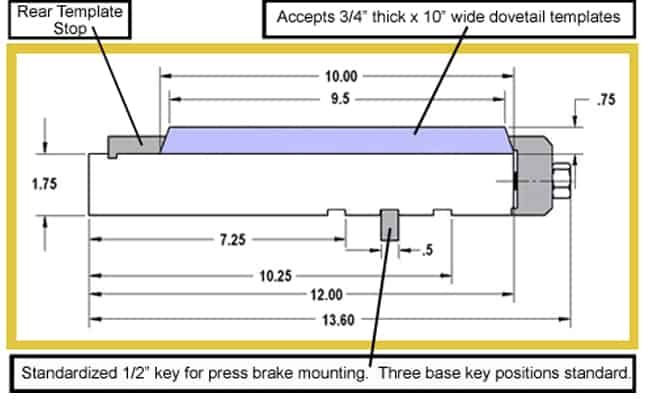 The UniPunch quick die change system is used on a press for faster changeover of setups of UniPunch tooling. The system provides clamping for dovetail style templates so there is no need for external hold down clamps. Short changeover time at the press is the prerequisite enabling capability for running small lots for the more frequent deliveries that customers are coming to expect. More and more factories are seeing the value in using dedicated setups of UniPunch tooling so they can change over quickly from part to part. 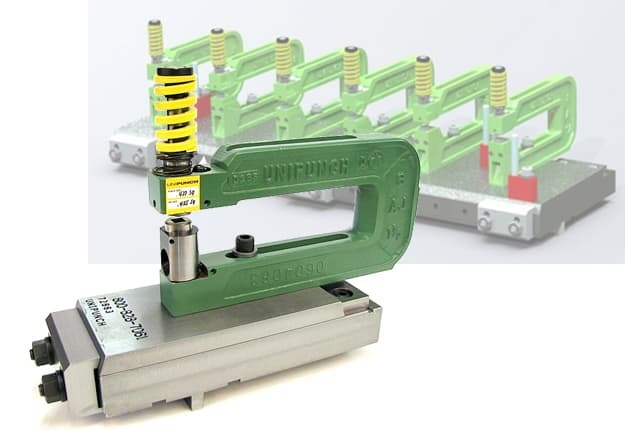 Below is a short video of UniPunch dedicated setups being changed at a customer location. With the UniPunch quick die change and clamping system you mount your dedicated setups on the dovetail style template. Then simply slide the template into the quick die change system, tighten the integrated front mounted clamps and begin making parts. Custom width and length systems are also available.